The costs of operating a fume hood often go unrealized, but in reality, it is one of the largest contributing costs in a laboratory. For the heating and cooling bill, having a fume hood operating year-round is like leaving a window wide-open in your house and then fanning air right out that window! So planning ahead and using the right fume hood system components can ultimately save thousands and thousands of dollars every year. The purpose of a high performance fume hood is to provide the highest level of containment at the lowest possible operating cost. Fume hood operating costs for a typical 6-foot hood can equal the annual energy costs of three average American households, so being energy-conscious with fume hoods pays off big. 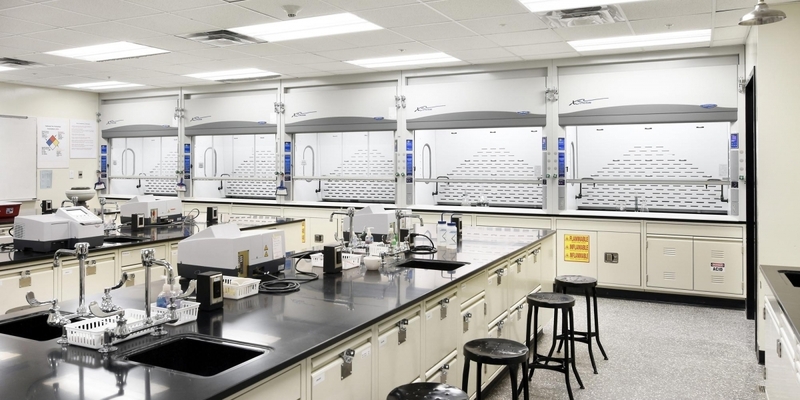 First thing’s first: You need to have high performance fume hoods in your lab. Certain hoods earn the label “High Performance” because they meet the SEFA definition of a High Performance fume hood. The standard is met if the fume hood is ASHRAE 110 tested with a fully open sash (25” minimum) at 60 fpm face velocity, and passes with an average of less than .05 ppm of SF6. Labconco takes it a step further and tests with a 28” sash opening at velocities as low as 50 and 40 fpm to ensure complete safety at a 60 fpm operating velocity. To compare fume hoods across the industry, it is important to look at the volumetric flow (usually measured in cubic feet per minute – CFM). The lower the CFM, the lower the energy bill. VAV systems are a type of whole building ventilation system that incorporates sensors to adjust the exhaust and supply air based upon the sash position (image above courtesy Tek-Air). For example, if a person has completed their work in the fume hood for the day, and the fume hood has a VAV system, shutting the sash starts an automatic (and safe) response to close a valve to the fume hood exhaust, decreasing the amount of tempered air being exhausted. It also sends a signal to the supply air, telling it to turn down the amount of air to enter the lab. Through this action, the amounts of air being conditioned and being exhausted are both lowered; therefore the lab experiences energy savings when the sash is lowered! An automatic sash positioning system allows the sash to go up and down automatically based upon motion detection. Since a VAV system requires the sash to be lowered to experience the energy savings, this additional component is extremely beneficial to a VAV system. This ensures the sash goes down after a programmed time delay, so there is no mistake of leaving the sash up, and the fume hood exhaust can be “turned down” at every possible opportunity. Though the breakeven point can vary depending on climate, energy cost, and usage, these tools provide excellent options for improving the safety and comfort in your lab while minimizing the cost to operate.